In the past, this country has always prided itself on the personal freedom and Constitutional rights of the individual, and oddly enough, it still does today despite the fact that the US currently ranks 41st according to the 2016 world press freedom index, and 11th on the Heritage Institute’s 2016 index of economic freedom, behind countries such as Singapore, Hong King and Chile. However, the facts have yet to stop the government, or rather the faction that co-opted the government, from carrying out its will and broadcasting whichever story reinforces that will. From lying about attacks and epidemics, to fabricating them all together, what this country once could have been is simply no longer present, where sadly, it truly counts: within the government, save for a brave few. But the people remain, and that American Dream still resides within their hearts and longs to be realized. Regardless of whether that dream was ever truly seen to fruition or if it was sabotaged by some of the very men who took part in its creation, it has taken root in the very foundation that holds this broken country together, it has become eternal; it prevails within the deep seeded beliefs of that which makes this country truly powerful: its people. From blaming the Russians with zero evidence, and pitting Americans against each other with race, religion and political standing, to the classic ‘lesser of two evils” ploy, this entire election has weirdly enough turned into one of the most important things that could have happened to the individual, as it shook us all out of complacency to see the true level of corruption operating right beneath our noses, while being told we are living the dream. To begin, I would like to discuss a study that wildly enough has not gotten much attention since its release, as something like this would only be ignored by a willfully uninformed populace. This study actually quantifies the irrelevancy of the American public in regard to their influence on the government and its policy. Researchers at Princeton University looked at more than 20 years worth of data to answer a pretty simple question: Does the government represent the people? So if you’ve ever felt like your opinion doesn’t matter and that the government doesn’t really care what you think, well… you’re right. But there’s a catch. Economic elites, business interests–those who have enough money to hire lobbyists–have a entirely different line on the graph below, and it’s much closer to the ideal representation. So in other words, this study clearly demonstrates that money, and those who have it, dictate this country’s true direction, not the people and their faux democracy. Ultimately, this shows us that the elites have the ability to get what they what, regardless of the American majority will, and the people pay for it. We pay for it with the most expensive healthcare in the world; we pay for it with the tax code that’s a complete mess; we pay for it with Internet that’s slower and more expensive, with wasteful spending, a floundering education system, a catastrophic drug war and one in five American children born into poverty. Almost every major issue we face as a nation can be traced back to this graph. Knowing that what we really think, and who and what we vote for, quantifiably and mathematically has zero effect on the outcome(which is actually a verifiable fact thanks to this study), why do we continue to participate? This would be the point where people get angry, or call names, conspiracy theorist, or un-American, all for striking at their foundation which is unfortunately built on lies, and that shakes people; shakes them to the point where they will refuse to acknowledge the reality that contradicted their beliefs, regardless of the presented proof. And I should remind everyone that this study was conducted by Princeton University. If we have reached a point where institutions, that were once relied upon for their integrity and principled research for the greater good, are now dismissed the moment they touch on specific topics, regardless of their findings, then the cognitive dissonance is in full effect. So considering all this, let’s discuss the lesser of two evils ploy that has swept much of those still desiring to vote. Every American is enlisted at a young age, and told their vote matters; that even one vote can make a difference. Yet that entire mantra came crashing down this election cycle when all were told that their vote would only truly matter, if and when they vote for one of two pre-approved, state-sponsored candidates; and were told this would be democracy at its finest. Intentionally manipulated polls are thrown out to convince the people that a third-party vote would indeed, not count. Yet, despite proof of these manipulations, many continue to fulfill their programming and plan on voting in-line. Consider for a moment the previous claim, of which there is ample proof; knowing that the polls being broadcasted by mainstream channels are falsified in order to give you–the voter–the impression that “the majority” is voting for either Clinton or Trump, consider for a moment the possibility that the actual majority could in fact be voting for someone else, and most likely are, or there would be no need to falsify the polls. You then dutifully go off to cast your vote reluctantly for the “lesser-of-two-evils,” still convinced by the onslaught of propaganda telling you that the age-old adage, “Every Vote Counts” only applies when you stay within party lines. Then consider that your one vote, as misguided and manipulated as it may be, could in fact be the winning vote that steals away the presidency from a potentially more deserving, better suited and morally sound third-party option, and all you had to do was vote for who you believed in. And this does not even take into account the very real problem, that no one seems to be talking about outside of alt media circles, that is voter machine manipulation. There is more proof to support both that it has happened in our past, and that it is under way this very day, and unless you know where to look, most will never tale notice. 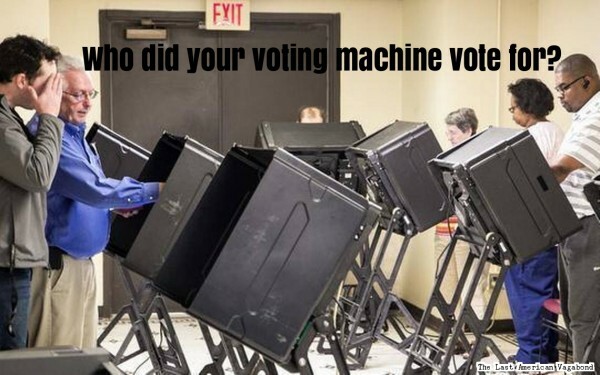 From machines being directly linked to George Soros, a man who has been clearly implicated for hiring protesters and inciting violence with the intention of manipulating the outcome of the election, to algorithms specifically designed to manipulate votes, this election is far from democratic. Ultimately, to allow the media to control your perception of what is and is not possible in the current election, or what will or will not count based on the current standings, will only lead you to settle for what seems plausible; to vote for their selection, and not for the candidate you truly feel will rescue the America we once knew. So I ask you today, with this nation’s future hanging in the balance; I plead with you today, to look into your heart and cast your November vote for the candidate you genuinely feel will lead this country into a time of prosperity and change; one who will put the people back in their rightful place, as the leaders of this nation. Do not fall for the “lesser of two evils” ploy, follow your heart, and do what you know to be right. However eye-opening this election has been, the awakening of the individual does not necessarily do much to stop this warmongering empire. Yet, we are now aware; and that has power; and the world will recognize. So we press on and spread the word, and hold out hope that those brave few within will join us in reviving this dream thriving within us all, and set things in motion that will revitalize this country.